Some people with very high needs require special accommodation that enables them to receive the supports they need. The National Disability Insurance Scheme (NDIS) refers to this as Specialist Disability Accommodation (SDA). Participants who are assessed as needing SDA as part of their reasonable and necessary supports will receive funding to cover the costs of SDA.Specialist Disability Accommodation is housing that enables people with very high needs to receive the support they need. SDA will provide funding towards the cost of the physical environment for eligible NDIS participants to live and receive their daily supports. The NDIS is committed to ensuring SDA provides homes for people with very high needs and not just simply a building where they live. This includes limiting the number of residents per house to a maximum of five in a single dwelling. SDA homes may range from a purpose built apartment in a mixed development through to a modified free standing house. It is important to note that SDA is not housing for all people with a disability, it only caters for those that need a specialist housing solution. How do I know if I can have SDA funding in my plan? 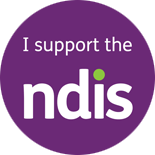 The NDIS has been established to provide reasonable and necessary supports to people with a permanent and significant disability. This means the NDIS can pay for supports that are related to your disability including, where necessary, support related to your accommodation. As an NDIS participant you will go through a planning process in which you meet with an NDIS representative to have a conversation about your current situation and supports. If required, this will include conversations about your need for SDA. This process may lead to an assessment of your need for SDA. Funding for SDA commences from July 2016 and will gradually be included as people become participants in the Scheme. How will I find suitable accommodation? If you are assessed as requiring funding in your plan for SDA support and need assistance to find a home, the NDIS will help you. That means that during the planning process you undertake with the NDIS, support hours will be included to facilitate finding accommodation and will include information about what SDA is available in your area. If there is no suitable SDA in your area, the NDIS will work with you to find a solution to meet your accommodation needs. By providing specific funding for SDA, the NDIS is encouraging existing and potential providers to invest in housing and ultimately grow the supply of suitable accommodation for people with very high needs. Innovative housing models that meet the needs of people with disability will be encouraged by the NDIA. The NDIA will continue to collect information on people’s needs for SDA across Australia and communicate to providers to help the market develop. How much will I pay for my accommodation? The amount of SDA funding included in your plan will depend on a range of factors including the type of building you require, how many people you will live with, its location and any additional features. Funding you receive for SDA is specifically to cover the cost of the housing – including the land it is on – as well as ongoing costs such as maintenance. In addition to this funding, NDIS participants will be expected to make a reasonable rent contribution. The NDIA will talk to you about how this will work. SDA funding is not for the support services a person will receive while living in their accommodation, this support is funded separately by the NDIS. Any board that the participant pays will be negotiated with the provider and will not include the rent contribution.